Illustration of chimeric antigen receptors on the surface of an engineered T cellISTOCK, SELVANEGRAChimeric antigen receptor, or CAR, T-cell therapy has proven itself to benefit some patients with leukemia, lymphoma, and other cancers when traditional treatments have failed to save them—even producing some long-term remissions in pediatric and adult leukemias and lymphoma. Two of these immunotherapies are now FDA-approved, and many more are in clinical testing. But these new treatments come with a cost, which can sometimes be fatal. Now, researchers have figured out how to better study two dangerous side effects: cytokine-release syndrome (CRS), which causes a suite of symptoms, and neurotoxicity. 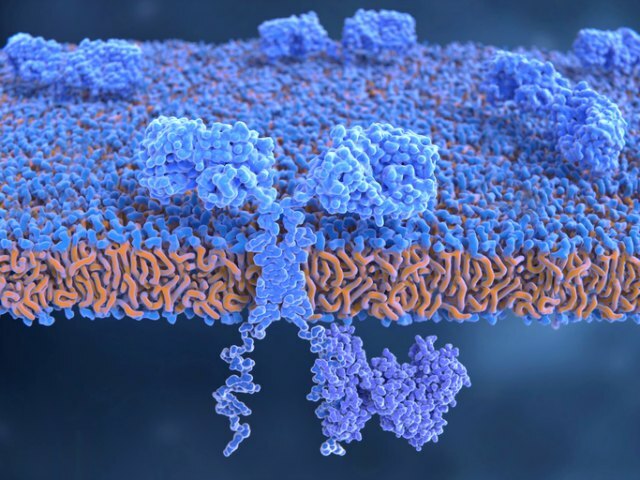 Using newly developed mouse models of CRS, two independent groups have pinpointed the cytokines responsible for the symptoms and found that cytokine blockers—some of which are already approved for use in humans—can improve the animals’ conditions and survival. The studies were published in the Nature Medicine May 28. These results open doors to developing ways to better modulate the release and damage of IL-1 and IL-6 by blocking the production of IL-1. “We have learned a lot about CRS and neurotoxicity by treating patients in the clinic, but until now it was not possible to study their pathogenesis and develop new treatments in the preclinical setting,” says Marco Ruella, associate director of Carl June’s lab at the University of Pennsylvania and part of the team that developed an approved CAR T-cell therapy for childhood leukemia. Ruella did not participate in either study. From the first infusion of CAR T cells in humans in 2009, scientists observed increased levels of cytokines in patients, explains Michel Sadelain, a cancer researcher at Memorial Sloan Kettering Cancer Center, a coauthor of one of the studies, and the first to start human trials with CAR T cells. It was a sign of trouble ahead. Too many cytokines, immunotherapy developers now appreciate, can lead to trouble breathing, hypotension, rash, fever, rapid heartbeat—the hallmarks of CRS—and sometimes to delayed and serious neurological symptoms. 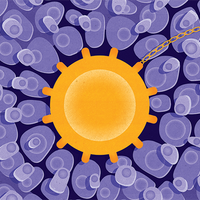 The conditions affect 15 percent to 70 percent of patients receiving CAR T cells. But little was known about why and how these side effects develop, and whether the treatment or the patients’ own immune cells were the culprits. It turns out, Sadelain found, that it is the mouse’s native immune cells, specifically, macrophages, and not the CAR T cells that produced the lion’s share of the offending cytokines. In addition to a cytokine called IL-6, the researchers found that CRS is mediated by two other molecules, IL-1 and nitric oxide. They could reverse the symptoms in mice by blocking IL-6 with the anti–IL-6 antibody tocilizumab, which is already approved to treat rheumatoid arthritis and which doctors use to treat CRS in patients. But in mice, the researchers found, CRS was actually more completely shut down by blocking IL-1 with a drug called anakinra, also approved for rheumatoid arthritis. Sadelain notes that if CRS can be more tightly controlled or prevented by using an IL-1 inhibitor or by engineering a way to block IL-1 into the CAR T-cell construct itself, it would enable more widespread use of CAR T-cell treatments outside university medical centers, where providers must be trained to treat CRS. In the other study, Attilio Bondanza, formerly at Milan’s San Raffaele Hospital and Scientific Institute and currently at Novartis Institutes for BioMedical Research in Basel, and colleague Marguerita Norelli of San Raffaele created a different mouse model of leukemia. They demonstrated that human white blood cells—monocytes made by the mice after infusions of human stem and progenitor cells—produce high levels of IL-1 and IL-6 during CRS and neurotoxicity. While drugs against both molecules decreased the number of mouse deaths from CRS, only the one that interfered with the receptor for IL-1 on monocytes (anakinra again) stopped lethal neurotoxicity. This is important clinically because neurotoxicity, which can mean anything from headache to seizure to coma, is seen most frequently in patients with acute lymphoblastic leukemia who are being treated with CAR T cells. “In neurotoxicity, there is no advantage to giving an IL-6 inhibitor because it does not cross the blood-brain barrier,” Bondanza says. Anakinra, on the other hand, is a small peptide that can cross the blood-brain barrier. When given in advance of CAR T-cell treatment to the mice, anakinra had a statistically significant effect on overall survival. Bondanza and Norelli also found that IL-1 production began many hours before of IL-6, and that it initiates the production of IL-6 in their mouse model, giving more evidence that IL-1 is a master regulator of IL-6 and other cytokines. These results open doors to developing ways to better modulate the release and damage of IL-1 and IL-6 by blocking the production of IL-1. “Now we need more data in the clinical setting,” Ruella says. The next step for Sadelain’s group is to determine whether blocking IL-1 can prevent CRS in patients. 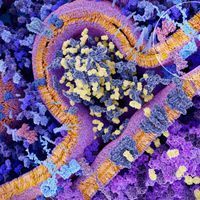 Ultimately, the researchers aim to engineer an IL-1–receptor blocker into the CAR T cells themselves. “We believe that the data here justifies this,” Sadelain says. Memorial Sloan Kettering has applied for a patent based on the use of IL-1 receptor antagonists to treat CAR-related toxicities. “These are important and encouraging preclinical studies, inferring that there could be ways to prevent or manage serious adverse events associated with CAR T therapy, including cytokine release syndrome and neurotoxicity, without compromising anti-tumor efficacy,” says Chris Boshoff of Pfizer, where he is responsible for early cancer drug development and precision immunooncology, including CAR T cells. 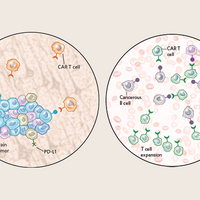 T. Giavridis et al., “CAR T cell–induced cytokine release syndrome is mediated by macrophages and abated by IL-1 blockade,” Nat Med, doi:10.1038/s41591-018-0041-7, 2018. M. Norelli et al., “Monocyte-derived IL-1 and IL-6 are differentially required for cytokine-release syndrome and neurotoxicity due to CAR T cells,” Nat Med, doi:10.1038/s41591-018-0036-4, 2018.